Why is Jabrick featured on the Palm Oil Free Certification Trademark? was very skinny & weak and the 'surrogate parents' (local villagers) realised they did not know how to care for such a young baby and so thankfully, surrendered her to The Centre for Orangutan Protection (COP)and was taken to COP Borneo Rehabilitation Centre. JABRICK was severely malnourished as she had been fed a diet of only condensed milk. 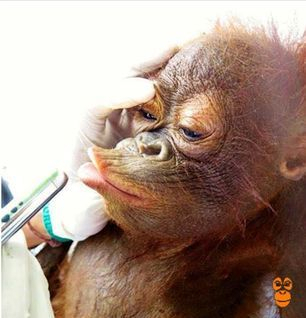 An orangutan baby in the wild can suckle from their mother for up to 8yrs and so JABRICK was denied the many antibodies and goodness normally absorbed from Mum. 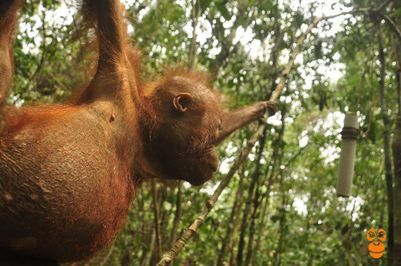 When JABRICK first arrived at the Rehabilitation Centre it took many months to bring her health to a level where she could attend 'Forest School'. Once there, however, although only a baby she was one of the top climbers and would often not come down at the end of the day. the highest tree and not want to come down at the end of each day. JABRICK, though still only the baby of the group was top of her Forest School class! In Late Dec 2015, disaster from a weakened immune system struck again and JABRICK caught influenza. Once again she received around the clock care, was kept warm and much effort was spent trying to encourage her to eat as she had little appetite. Her condition deteriorated as she would not eat or drink and finding veins to intravenously feed her became increasingly difficult. Sadly on 15th January JABRICK climbed her highest tree yet and passed away. With Compassion & Soul (who funded the build and operation of COP Borneo for the first 3yrs) and The Centre for Orangutan Protection (who manage the centre) remain absolutely devastated as she was one of COP Borneo’s little champions. 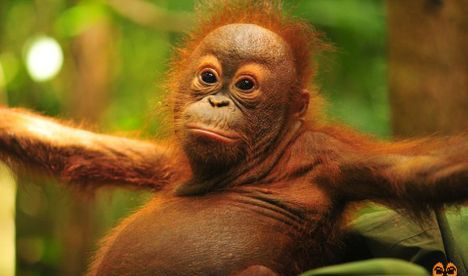 The baby orangutan featured on the Certification Trademark is JABRICK.This Certification Trademark is dedicated to her and the thousands of fauna who have lost their lives due to deforestation and habitat destruction. 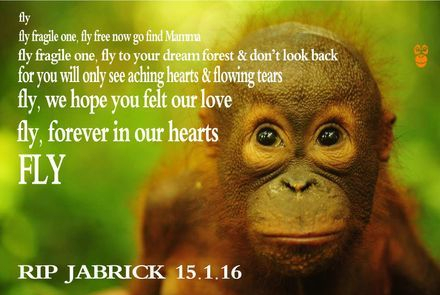 You live on through this Palm Oil Free Certification Trademark, we will never forget you.